Among 2 600 top wines from all over the world only 800 were awarded the precious Gold and Silver medals - with 30 medals only for wines from Alsace. 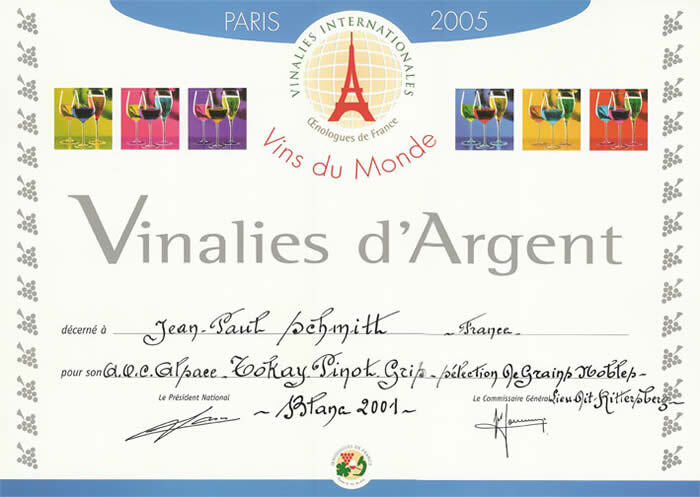 After many years of successful presentations for the Vinalies Nationales, Jean-Paul Schmitt decided to present for the first time in the history of the estate 2 wines at the Vinalies Internationales 2005 in Paris. The Gewurztraminer Rittersberg Vendanges Tardives 2002, a late harvest Gewurztraminer containing 12.1 % alcohol. Almost unbelievable is the residual sugar of this wine: 122 grams per liter - pure natural sugar from the Gewurztraminer! 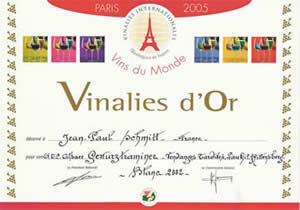 In 2005 about 2 600 top wines from all over the world were presented and tasted by the international jury of oenologues and other wine specialists. This Gewurztraminer was actually harvested in 2 sections of our Rittersberg vineyards - in one section the wine stocks are 30 years old and in the other section, they are 70 years old. From all wines presented, the jury awarded just about 800 wines with the precious Gold and Silver medals and among those, only 30 medals were awarded for wines from Alsace. The grapes have been harvested end of October 2002 in several goes. Both lots are exposed southeast with a 25% gradient. The soil is from fine granite sand, about 1.5 m thick, based on a clayey underground. The grapes were hand collected and entirely pressed. The wine's fermentation took place in stainless steel barrels that are temperature controlled. This wine actually could be sold as Sélection de Grains Nobles since we achieved all certificates and quality requirements by law - however, we decided to market this wine as a very high class Vendanges Tardives. Gold medal for the Gewurztraminer Rittersberg, Vendanges Tardives 2002. The production of this outstanding wine was limited and only 800 bottles 750 ccm as well as 250 bottles 500 ccm are available. The Pinot Gris Rittersberg, Sélection de Grains Nobles 2001 was growing on a special lot in our vineyards at the Rittersberg (mountain of the knights) exposed south-east consisting of granite pebbles that are about 2 m thick above a huge, solid granite block. The wine stocks are 52 years old and produce very small grapes only. This wine was harvested when all grapes showed the noble rot that comes from the fungus Botrytis cinerea and is the essential requirement to produce a SGN quality wine. With a very low productivity of only 15 hectoliters / hectare (hl/ha) this wine had a potential of 27 ° alcohol at the moment of harvest. After the long fermentation of 18 months a 600-liter French oak barrel, this wine is now presented with 9.55 % alcohol and has still a residual natural sugar of 171 grams per liter. The production of this rare wine is very limited and only 900 bottles of 500 ccm are available. Sales of this wine will start in May 2005 - however, it is advised to keep it at least until December 2005. This wine will be best from 2006 on. Tomás Montan visited us more than a year ago for a wine tasting. 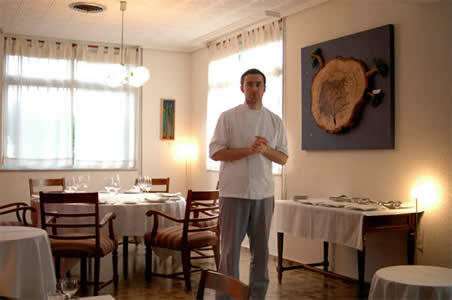 This young chef liked our wines and promised to order some Rittersberg wines once his own restaurant is opened. Only few months later, we received Tomás' first order and now his customers can enjoy a nice glass of Pinot Blanc or Pinot Gris in VALENCIA! At the Vaixell Restaurant you have the choice of about 40 different wines, certainly all from Spain - except some wines from Jean-Paul Schmitt - and all very reasonably priced - same for the food! The wine list for the red wines offers a huge variety of wines from southern Spain but as well the great reds from Rioja alta. Or go for a glass of sparkling Spanish CAVA. Tomás menu reads very exciting: an interesting mix of Spanish food with some Japanese Tempura, terrine de foie - just to mention 2 starters. Finally, you can select from at least 6 different 'Postres': home-made cheese cake, mousse au chocolat: white and dark or a refreshing lemon sorbet with some Vodka?